Entrance hole to the sub-nivean world. Photo by the Seney Natural History Association via Wikimedia Commons. The sub-nivean zone (“sub”= under, “nivea” = snow) occurs in a protected area between the upper-level snow pack and the earth’s surface, where the temperature hovers around 32 degrees (F). The upper levels of snow provide insulation, while the lowest level melts slightly due to the heat from the earth’s surface, providing water and unfrozen food sources. Indeed, a whole winter ecosystem exists here, a fact that was not widely known until relatively recently. Rodents living in this zone create tunnels, air holes, latrines, and nesting areas, feeding on grasses, insect eggs, and whatever else they can find during the winter months. Next time you are out walking in deepish snow, keep an eye out for traces of predators, such as fox jumps or owl/hawk punches. 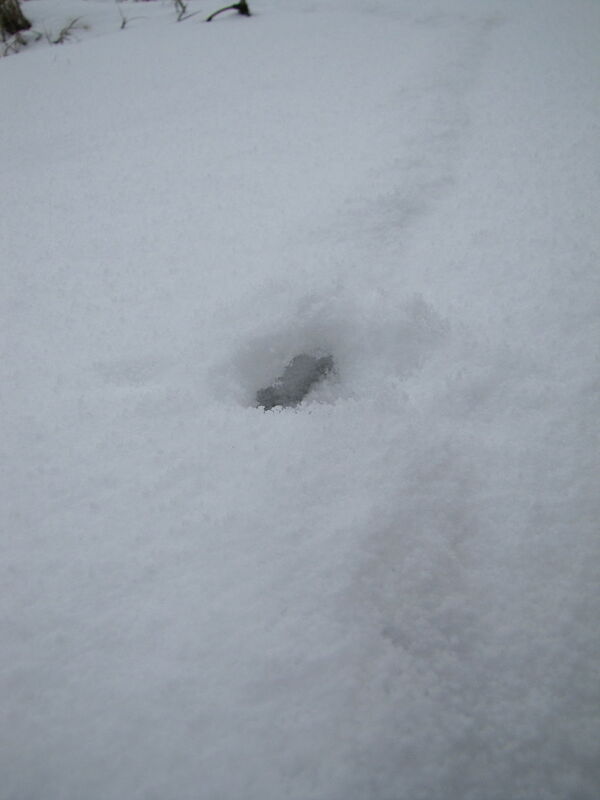 (In the photo below, note the marks left by the wing feathers and the hole punched through the snow by the bird’s feet.